PRMc is a compact all-in-one solution for document reading and verifying. All PRMc passport scanners use the high performance optical character recognition (OCR) algorithm that has been developed by ARH Inc. The built-in digital signal processor unit (DSP) significantly speeds up image-processing, thus efficiently reduces queuing time. 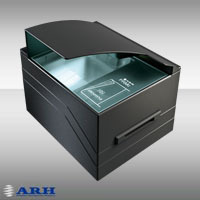 PRMc document scanners are a smart combination of traditional document scanning devices: fast, accurate and reliable devices that effectively help your daily business with performance and stylish look.